In this article, we will go further into the results and discuss this approach from a manufacturing perspective. Just a recap of the important information. The material of the bevel gear is SCM420H and a saw-cut circular bar (radius 17.5 mm x height 39.0 mm) was used as the initial shape of the material. Die speeds of the second stage: -1.0 mm/s (upper die), 0.0 mm/s (lower die). A constant shear stress friction was used as the friction condition for the analysis. 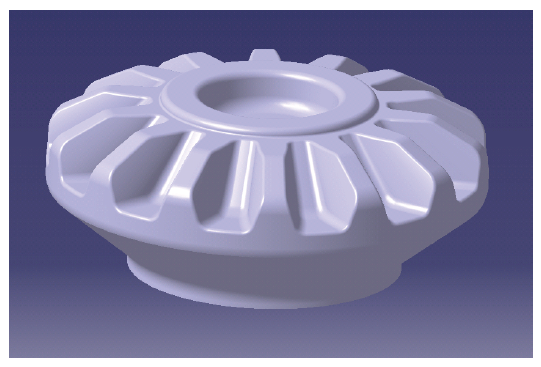 The friction coefficient of the upper die to produce the tooth profile was assumed to be 0.2. The friction constant of the remaining dies was assumed to be 0.1. Figure 2 shows the FE predictions of deformation obtained using AFDEX. 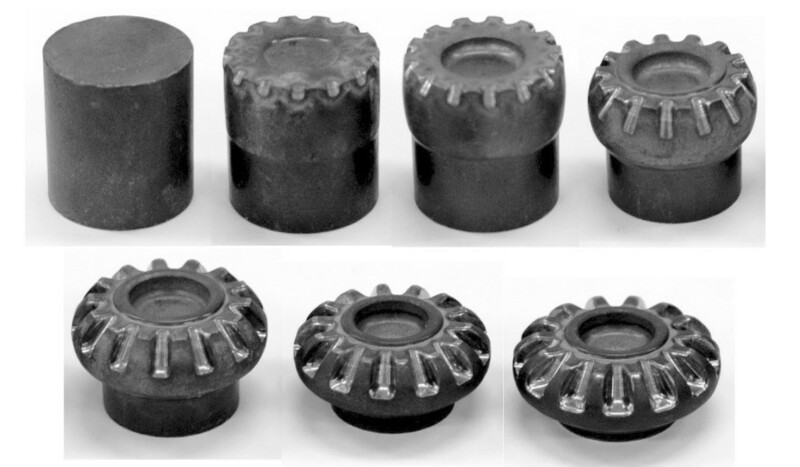 In the conventional bevel gear die processing method, the die is usually completed by lapping after electric discharge machining. This method requires a lot of time for lapping because the discharge surface roughness is not good. Moreover, it is difficult to verify the accuracy. In this case, CAM information is generated after directly modeling the bevel gear and the die is directly manufactured by the high-speed processing machine by using it. Figure 4 shows the die and the punch thus manufactured. The preparation of workpiece material in closed forging is also very important. Since the shape of the workpiece changes massively during closed forging, the material must be softened through a spheroidizing annealing process. If the annealing temperature is not set properly, cracks may occur in the closed forged product. Shot peening is applied to the un-coated raw material to remove scales, decarbonized layers and foreign substances on the surface. The surface of the material is generally treated with a phosphate coating to improve the lubricity. The phosphate coating alone may not be able to impart a sufficient friction coefficient and sufficient slipperiness for processing. In such a case, the material and the dies are stuck, and the surface is not clean, so a stronger lubrication treatment is required. In this case, molybdenum disulfide (MoS2) lubricant, which is superior to general lubricant, is used because bevel gear closed forging is accompanied by severe shape change. Annealing heat treatment and molybdenum disulfide (MoS2) lubrication treatment were also performed between the first stage and the second stage. For the purpose of pilot production, the hydraulic press shown in Figure. 5 (a) and the closing die set shown in Figure 5 (b) of Gyeongsang National University TIC was used. This hydraulic press has specifications such as pressure capacity of 10000 kN and stroke length of 600 mm. 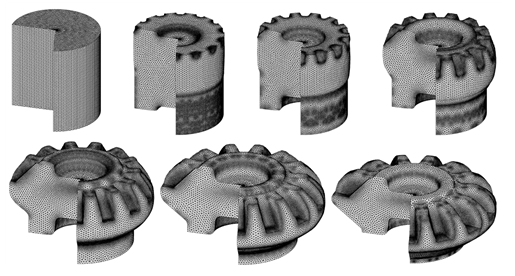 Figure 6 shows the test results of the closed forging of a bevel gear produced using the above-mentioned die and equipment, and shows the deformation history of the work piece material during the forging process. As a result of the visual inspection, defective elements such as defect of lubricating film, breakage in forming state, folding, cracking, and scratching did not occur. The single pitch error, the adjacent pitch error, the cumulative pitch error, and the shaking of the groove was also checked using a bevel gear tooth tester. Quality assurance is very important in commercial development of economical bevel gears. It is essential that repetitive fabrication of the same die should be supported. The production method and the process design must be robust and efficient. Figures 2 and 6 show that the experimental and analytical results are very similar. That is, as a result of comparing according to the stroke distance of the upper and lower punches, the shape of the material entering the die and the shape of the tooth profile are very similar. In the comparison of Figure 7 (a) and Figure 7 (b), the predicted and experimental results agree very well.